Right now, I'm finding the radishes at the farmers markets irresistible. Back in October, I dinned at Daniel Humm's NoMad in New York City. 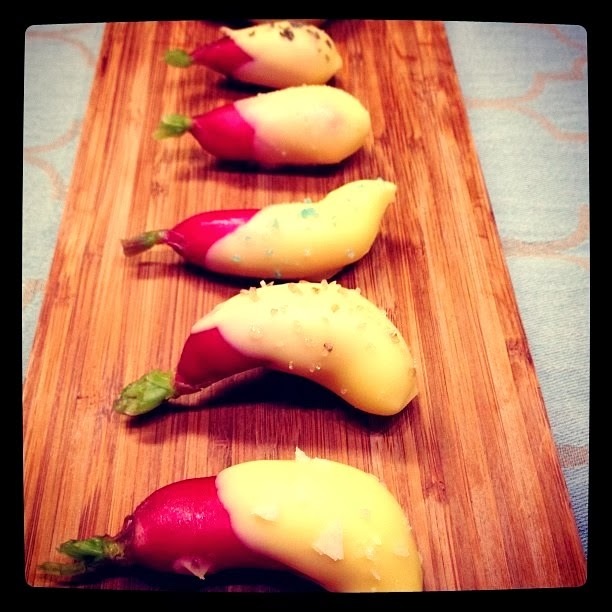 The star on the menu were these butter-dipped radishes with fleur del sel. Since then, they've been in the back of my head.... "I'm going to try making these one day!" That day has come. It took a lot of playing with the butter, getting the consistency just right for dipping. You know I like to play with my food. This is such a simple, indulgent, festive treat for the holidays. And it holds pretty well in the fridge. It would pair well with my long-standing Christmas tradition morning treat of smoked oysters and cream cheese on crackers with mimosas. These flavors are simple and clean with the crisp spiciness of the radishes with the creaminess of the butter and the salt to bring it to life. Make sure to use very good quality unsalted butter. I used Irish butter. For salt, use whatever floats your boat. I just had fun with different varieties I had on hand. Note on radishes - I thought the fingerling ones would look nice, but now I know the regular ones would actually be easier to dip. I'll have to make another batch for Christmas morning. Clean and dry the rashes well, leaving a tiny decorative top to make it easy to dip. Keep cold in fridge until butter is ready for dipping. In a really tiny sauce pan, overly extremely low heat, slowly melt a half stick of butter with stirring. Remove from heat once almost melted. Slowly add in pat by pat of the non-melted butter into the melted butter. This takes some time and patience. This is called tempering the butter; getting it into an amorphous state of where it's somewhere in between being a liquid and a solid. It's pretty cool. This is the state in which the radish is dipped, actually hangs onto in a nice, substantial thickness. The trick in tempering the butter is to have plenty on-hand at room temp, not melted. Add that in pat by pat with stirring after each addition until melted. You want to butter almost like a hollandaise sauce. That's when it's perfect for dipping. You have to work this fairly quickly, so pretend you're a dipping and salting manufacturing line. Have a cookie sheet lined with wax paper or parchment for the butter-dipped radishes and a little dish of salt to sprinkle on immediately after each radish has been coated. Another option is to put a little pile of salt on the platter to dip as needed while eating - this is probably the better option. Either way don't worry, they don't have to be perfect. Sometimes there is more beauty in the imperfect. Besides, these get eaten so quickly, no one will care too much about the aesthetics. Happy holidays! Merry Christmas and Happy New Year! I heard that broccoli will replace kale and Brussels sprouts as the hot vegetable of choice among healthy hipsters. Admitting, I myself have not had broccoli for quite some time.... So I was thankful that broccoli is the focused produce this week. The first thing that came to my mind was pureed broccoli. It's super easy, fast, comforting, great color, and flavorful. I used a bag of broccoli florets. However, a head of broccoli would even work better, and including the peeled stems - such great flavor there. I microwaved the broccoli with a few skinned cloves of garlic. Then pureed it in a food processor with butter (olive oil would work too), salt, and pepper. Microwaving keeps all of the nutrients intact without diluting them as cooking it in water would. No extra liquid is needed. There is a small amount of liquid after cooking the broccoli in the microwave, which turned out to be the perfect amount needed for pureeing to the perfect consistency. I tried adding half and half, but I found it muddled the clean broccoli and garlic flavor. You know my motto, keep it simple and flavorful. Place the chopped up broccoli and garlic cloves in a large microwave safe bowl, and cover. Microwave on full power from 4 to 6 minutes until steamed and bright green. Dump entire contents into a processor. Run and add in the butter/olive oil and salt and pepper. Wipe down sides and taste for seasoning. Adjust salt and pepper to taste. This is a great side to compliment any meal. I recommend it with roasted root vegetables of your choice or even a baked potato or potatoes Anna.